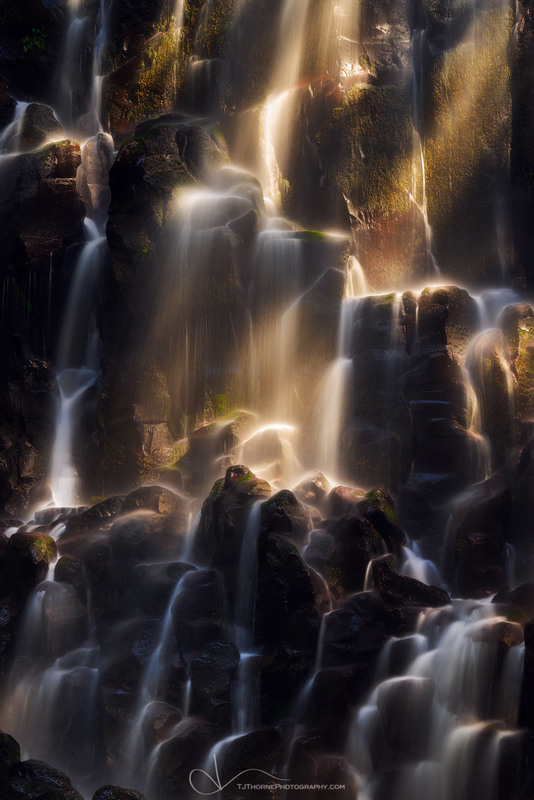 Direct light strikes Ramona Falls in Mt. Hood National Forest, Oregon. I've been fighting a lot of personal battles lately. Though I ALWAYS try to be optimistic, hope, dream, and give it my all.. sometimes I let it get the best of me and negativity becomes a more dominant trait. People who know me well know that I absolutely CANNOT continue to feed that energy or succumb to it. The consequences for myself and those around me are pretty grave. I've done a lot of work to steer from that direction.. but the pull is still very real. My relationship with nature is very personal to me. It's profound and hard to convey. When I can finally let my worries and negative energy slip away, if even for a couple of minutes, I am overcome with emotions to the point of tears. Goosebumps cover my body. It's a moment of warmth coursing through me that I don't get every time I go out.. but when it happens I KNOW that I am in the right spot in life. That feeling is what living should be about. I've avoided Ramona Falls for over 10 years. I tend to avoid the popular hikes, especially in the summer. However the summer is pretty much only when you CAN hike this trail. What I learned about this trail is that it's popular for very good reason. The trail gains elevation so gradually that it felt like walking on flat ground. Ramona Creek gently meanders and cascades along the trail through a literal carpet of moss and ferns. The sunlight poured through the trees from a cloudless sky, diffusing into warm golden light. The temperature was perfect. It's hard to not photograph the creek. Part of my relationship with nature is that I must literally FEEL it. I get into it. No waders, no waterproof socks, no tiptoeing on rocks. I enjoy feeling the glacial waters permeate my clothing and chilling my skin. I enjoy the process of becoming so immersed in the elements that I become one with them. That is when I can get into my creative process. I become balanced. My heart is open. My soul is at ease. When I stepped out of the creek and realized that my shooting partners had continued on ahead, I was hit with my moment. Here I was alone, for the most part, in a fairytale setting. I stepped into a ray of sunlight and closed my eyes. For 5 minutes I stood there and absorbed. I tapped into every sense I could and LIVED that moment. The sound of the water, the smell of the forest, the warmth hitting my face, the cool wetness of my clothing, and the bright sun piercing through my closed eyes. I let it overtake.. overwhelm. I opened my eyes and looked around. I was content. Instead of rushing from one place to the next like I normally do in my life I slowly walked on. I shuffled my feet through the pine needles, looked more intimately at my surroundings, and thought 'THIS is what life is'. To me, there's no faster therapy than the nature that surrounds me. I'm so incredibly grateful that I live somewhere with such easy access to diverse natural settings. I'm working towards surrounding myself with nature on a more constant basis so that I can live more balanced. That road will be a hard one full of uncertainty and sacrifice... but I have hope that the view at the end is nothing short of amazing.